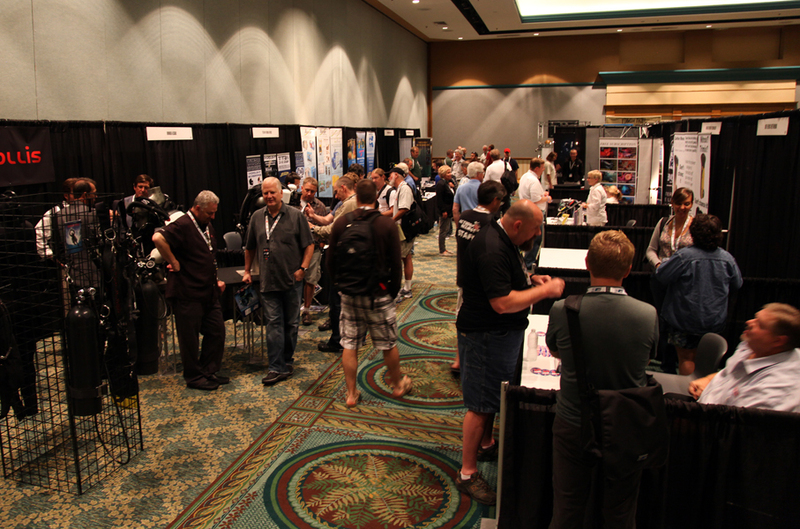 Rebreather Forum 3.0 brought together the leaders and shakers in the rebreather world May 18 – 20, 2012. The event took place in Orlando, Florida at the Caribe Royale Hotel Convention Center. Participants from around the world gathered to listen to and participate in presentations in three areas of concentration, incidents, design and testing, and operations and training. The event had over 400 attendees. The last rebreather forum occurred in 1996 in California. The sixteen years that have passed since that event have brought with it many substantive changes within the industry. This meeting would challenge old thinking and consider if the foundational questions had changed much at all. To codify the state of the art of rebreather use, including issues such as ventilatory characteristics, oxygen control, CO2 control, automation, warnings, bail-out system, redundancy and backup systems. To review available data for accident analysis and avoidance. To review training and operational protocols. The event was made up of a preamble Explorer Day followed by two and half days of forum events. 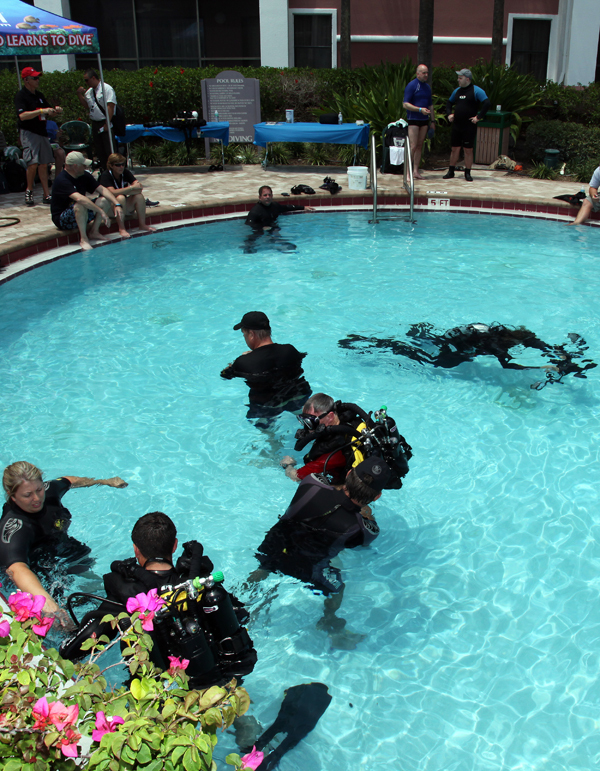 The Explorer Day allowed participants to “try dive” units of their choice in the hotel pool. AP Valves, Revo, Titan, Inner Space, and several other manufacturers participated in the demos. The presentations were broken into three concurrent tracks with various talks of a half hour to one hour in length. These tracks focused on general rebreather topics, rebreather medicine and physiology, and rebreather business and operations. There was a ready supply of enthusiastic newcomers to rebreathers with many demo participants having never tried a rebreather before. All of the presentations were standing room only with some stretched for space. Notable speakers like Richard Pyle spoke on his diving with rebreathers and the evolution he has seen since the last rebreather forum. Dr. Simon Mitchell presented on CCR Physiology. Jill Heinerth put forward her Five Golden Rules for rebreather diving. Richie Kohler talked about the importance of checklists. James Morgan showed why he stopped blowing bubbles, well sometimes stops blowing bubbles. Evan Kovacs got the audience very close to the action of his film subjects with the help of rebreathers. One big surprise was when training agencies TDI, IANTD and ANDI shared their certification data regarding rebreathers in an open session planting the seed for open sharing in the future with all agencies. The forum program proceeded in the evening after the Explorer Day. 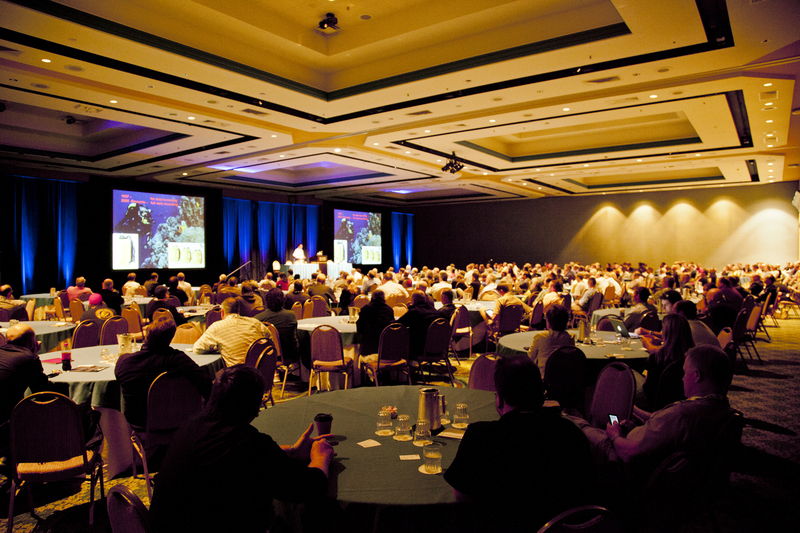 The forum format changed to a single track of presentations in the large ballroom. Dr. Drew Richardson opened the forum. Michael Menduno provided a retrospective of what has been learned from Rebreather Forum 2 with many of the players from that event present at the current event. Dr. Richard “Harry” Harris led us through his inspiring deep work in New Zealand and Australian caves with an emphasis in overcoming obstacles in exploration. The evening wrapped up with a panel on different user groups within the rebreather community. In a stark contrast to previous events, the US Navy openly shared their user data and incident rates. 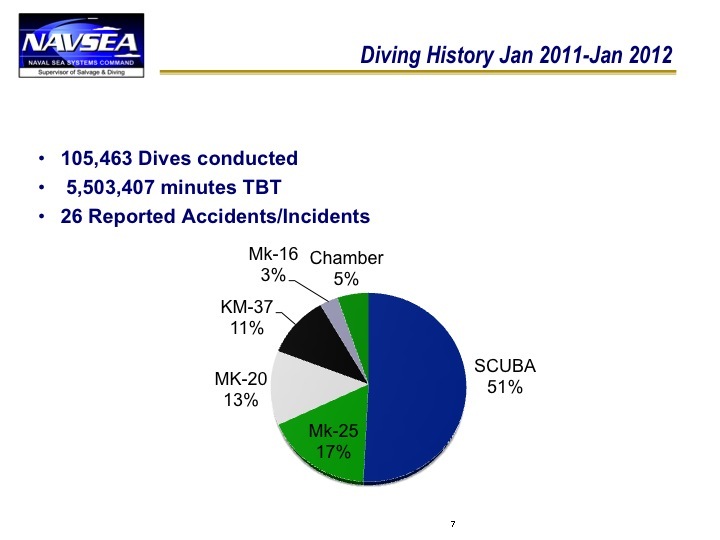 Supervisor of US Navy Diving, Commander Runkle, presented diving statistics for the 2011 year of diving. The US Navy conducted 105,463 dives with a total of 5,503,406 minutes of Total Bottom Time. Twenty-six incidences were reported. Forty-four percent were related to rebreathers with the remainder being related to open circuit scuba and chamber operations. During the previous five years the majority of incidents with navel rebreather use were related to lung trauma with forty-one percent attributed to air gas embolism. Most of these related to the use of oxygen rebreathers. This is the first time the navy has been so open with their data. This should allow researchers to begin to establish a denominator related to rebreather use and incidences in at least this population of users. A focus on incidents brought the morning to a humbling beginning. Chaired by Dr. Petar Denoble, DAN’s incident guru, the sessions were focused on what the origins and results of fatalities and near miss incidents have been thus far. 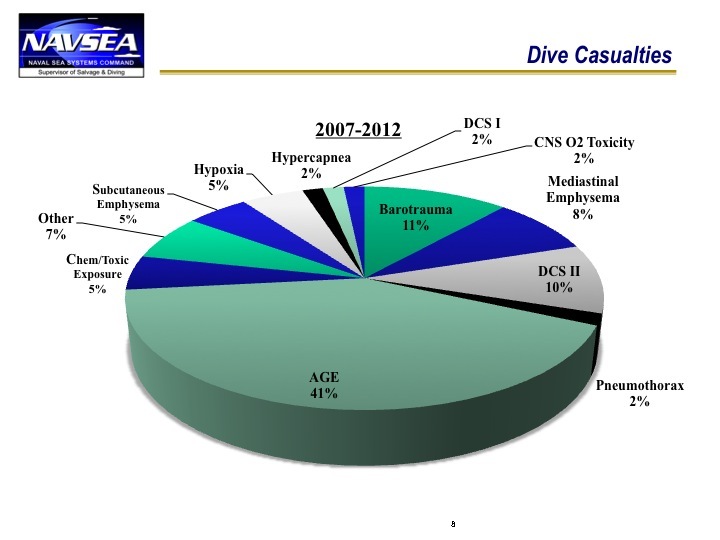 Dr. Andrew Fock gave an overview of CCR Diving Fatalities and review of known events. Lawyer David Concannon spoke to the legal cases that have arisen from incidents. He reviewed cases he has defended and spoke to the need to pay more attention to triggering events that lead to fatalities rather than just the end result of the fatality. Bill approaches rebreathers with the same mindset as he does when working on projects with NASA. His analysis compared failure modes for open circuit to closed circuit. The development of machines that can recognize and deal with variable environments and problem solves was illustrated by his footage of the self-driving car work he conducted with NASA. Putting the Google car to shame, this vehicle can drive itself and recognize appropriate paths off road. Many of these projects have lent ideas and technologies for the “smart systems” being incorporated into today’s rebreathers. This is one of the big changes since the last forum. This wrapped up the segment on incidents. What was clear from the morning was that there can be advances in technologies and smart systems, but engineering will not remove the diver from the system. Recreational diving will always be diver dependent. You cannot engineer the diver out of the system. So, there is also a need to focus on fixing the diver on all levels. This places a high standard on training and community development. If the user base is going to grow quickly a focus on this will be more necessary than ever before. Focus Zone 2 revolved around design and testing. Chaired by NEDU’s Dr. John Clarke, this focus area occupied the majority of the event. Martin Parker of AP Values spoke about real time monitoring. The talk was highlighted by a discussion of the systems they incorporated into James Cameron’s Deep Explorer sub for his successful dive to the deepest depths of the ocean. Dr. Arne Sieber presented on oxygen sensor technologies. Current sensor technologies have not changed much for a long time. There are pressures to change sensors to comply with environmental laws that may make them incompatible with rebreather use. This is scary news for rebreather divers. The good news is that new technologies are being developed that could be available soon. Data was presented that sensors are much more temperature sensitive than most would believe. So, special care should be used when dealing with lower temperature environments. Also, real time in mouthpiece oxygen and carbon dioxide monitoring has been beta tested. Not ready for inclusion in production units yet, it speaks to a bright near future for improving this vulnerable area of the technology. Kevin Gurr reported on online research he conducted into rebreather diver behaviors. Results were self-reported by rebreather divers. Scary data resulted. A large number of divers were ignorant to the units they were diving and owned. Simple capabilities and confusion about durations and depth limits were clear. Sixty-four percent of those that self reported symptoms of carbon dioxide issues did not bailout nor did they end the dive. The second half of his presentation focused on carbon dioxide sensors. He believes we are four to five years away from real time in mouthpiece monitoring on production units. Dr. Dan Warkander of the US Navy’s Experimental Diving Unit (NEDU) talked about carbon dioxide scrubber technology. Dan spoke to the need for clear understanding of scrubber capabilities for temperature, workload, and depth with more available information from manufacturers to help divers make intelligent decisions about duration. He presented data from navy tests that illustrate that canister durations can vary as much as five to twenty times based on temperature, depth, and workload. Pointing to the importance to know the numbers for the unit being dived and the conditions it is being dived in. Bruce Partridge of Shearwater fame finished up the day presenting on information technologies and the incorporation of real time data tracking into rebreather systems. Bruce illustrated that no IT solution or mitigation designed into a rebreather can replace the need for checklists. He did a wonderful job looking at how other industries have dealt with risk and how it was mitigated. It is clear that a lot more data tracking is in the future. The evening concluded with a gala dinner. The keynote speaker was Dr. Michael Gernhardt, a NASA astronaut and diver, talked about exploration from sea to space and back. The primary focus of his work has been on decompression modeling and space suit design. More recently he has been working on the mission to mars and the more recent focus on near asteroid exploration. Video of the mission testing brought the technology to life. The presentation was a fascinating look at the future of space exploration with exciting possibilities of spin off benefits for rebreathers in the future. Dr. John Clarke continued chairing his focus area on testing. Dr. Nigel Jones spoke about oxygen control. Gavin Anthony and Mike Ward talked about pre-market testing. Third party testing of units is the only way to verify the data provided is unbiased and can be trustworthy. It is required of CE compliant units and the standard by which most have relied for decades. Luckily, it is far more common today than at the time of the last forum. Vince Ferris of NEDU and Oskar Franberg of Sweden presented on post incident testing of rebreathers. The need for resources for analysis of rebreathers after an incident is clear. Both of these gentlemen do this for their respective navies. Civilian resources are limited and there is a clear need for resources to assist when there is an incident. Dr. John Clarke closed the focus session with his favorite topic, semi closed rebreathers. He playfully pointed out that the ultimate rebreather is the earth. His work at the NEDU has allowed John to see and experiment with so many units and technologies that it is remarkable how broad his knowledge spans. He pointed to some of the newer technologies possibly making semi closed rebreathers an option in the sport market. After lunch focus zone 3 began concentrating on operations and training. Phil Short chaired the session. First up was a panel chaired by Dr. Jeff Bozanic on operations. Dr. Richard Pyle discussed the history of his “twilight zone” fish collecting in the mesophotoic region. He has a return on time of twelve new species of fish for every hour of bottom time. He has also seen that for these deep technical dives open circuit requires over twice the hours of support than that of closed circuit. US Park Service has found that rebreathers have increase work productivity by thirty-two percent over open circuit. Most of the work being done is in the fifty to one hundred feet ranges. An entertaining segment of the panel was a presentation on opinion versus science. Those on the inside of rebreather understand well that opinion and science can be tough to distinguish when it comes to this topic. The question still remains; will opinion or science dictate policies for rebreathers in the future? Jill Jeinerth and Terrence Tysall chaired the final presentation focused on training. Rather than having a traditional panel they decided to have a series of questions with audience participation to help answer them. The majority of time was spent on the question of how to encourage or drive the use of checklists. The root of the discussion was how to drive community behavior and move away from complacency. A difficult question under any circumstances with the hopes of massive increases in users the timing is critical to address the issue. How can you drive change in cultural bias when that bias is not good for diver outcomes? Some hopes were presented for engineering that would require the behavior or not allow diving. Some pointed to increased strictness in training requirements. But, in the end, there is nothing that can make a diver not be complacent. Attitude can be modeled, but not trained. So, although these solutions can contribute to a new cultural bias, they cannot make it happen. The diver cannot be engineered out of the equation. A paradigm shift is required of all existing rebreather divers. Speaking up when behaviors are witnessed that clearly deviate from safe practices needs to be standard operating procedure. Terrence rightfully pointed out that we can go to a system based operation, but that is not going to be very pleasant for those that want to be able to dive without controls and support staff. So, how do you shift to a new “good” cultural bias? It is a difficult question and there is no easy answer. Jill believes that checklist use needs to become the cool thing to do. She believes that the role models in the sport need to drive that effort. In some ways the changes in behavior can be easy, if it is established in the new users if that new user group explodes in number of users. Much like a generational shift, not many remember not having CDs and many younger people have no concept of music being anything but a digital file. The problem is if it does not change for them, then you are left trying to correct behavior already established in a much larger group of users than before. So, the time is critical for this effort. There was an assumption that training is taken care of by the audience, that there is little work to be done there. In the last Forum, it was a critical question. Advances in rebreather design may make the challenges easier to deal with, but the glaring lack of questions regarding the area of training should be considered when looking forward. Is it safe to assume that training is adequate and not deserving of close evaluation? Does the condition of training currently available in the industry warrant this belief? Even with new developments, is training covering the necessary topics and providing the discipline and skills necessary no matter what the engineering requires of the diver? Is instructor quality still or even more bound to good student outcomes than before? 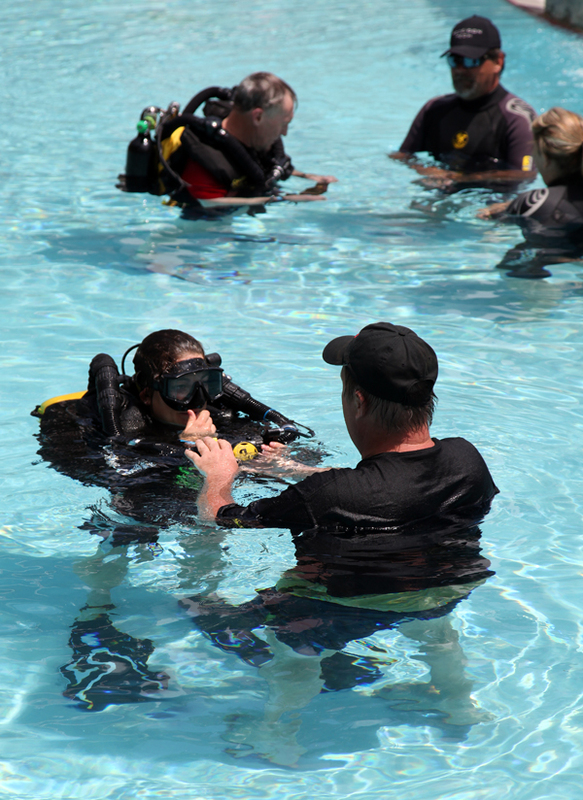 Can a massive increase in users be safely handled if the instructor still matters far more than the program being used to train the diver with? What should be done about it if this is all true? Michael Menduno, the organizer of the first two rebreather forums, said, “I believe that rebreather technology is at another inflection point in its development. The first coincided with the emergence of technical diving—what you might call the “mix revolution,” which represented necessary infrastructure for the development of rebreathers. At that point, rebreathers like Bill Stone’s Cis-Lunar Mk-1 were just a tech diver’s dream. The second inflection point was in the mid-90s, with the emergence of the first sport diving rebreathers like Ambient Pressure’s Inspiration and the Dräger Atlantis.